One synthesizer may sound nice on its own, but sometimes you want things to be a little thicker. Maybe you want to add some bass to a sound or give a bassy sound some interesting high end. Imagine being able to control multiple synthesizers with the touch of one keyboard. Ableton Live makes this extremely easy to do. 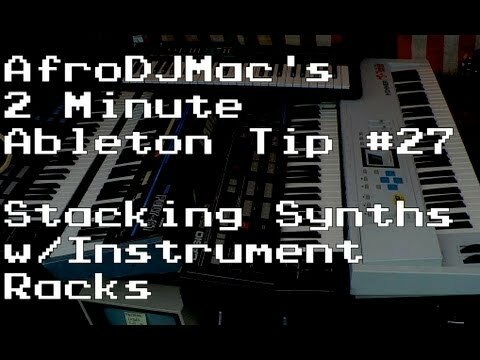 In this 2 Minute Ableton Live Tip, I will show you just how easy it is to layer synthesizers on top of each other in a single midi track in Ableton Live. The creative and sonic possibilities this opens up is endless. Check out the video below, in which I use the AfroDJMac MegaBrute Collection to demonstrate. I'm sure you can imagine, this technique allows you to quickly and easily build very complex sounds. Try out some interesting things. On a piano sound, layer a slowly evolving pad that only creeps in on longer sustain notes. Fatten up a weak kick drum with a thicker heavier one underneath. On a synth lead, add another synth that generates a little white noise to dirty up the sound. The possibilities as always are endless. All sounds in the video created with the AfroDJMac MegaBrute Collection, On sale now! Works in Ableton Live 8.2 and above. More Ways to Turn Your LaunchPad into a Push!